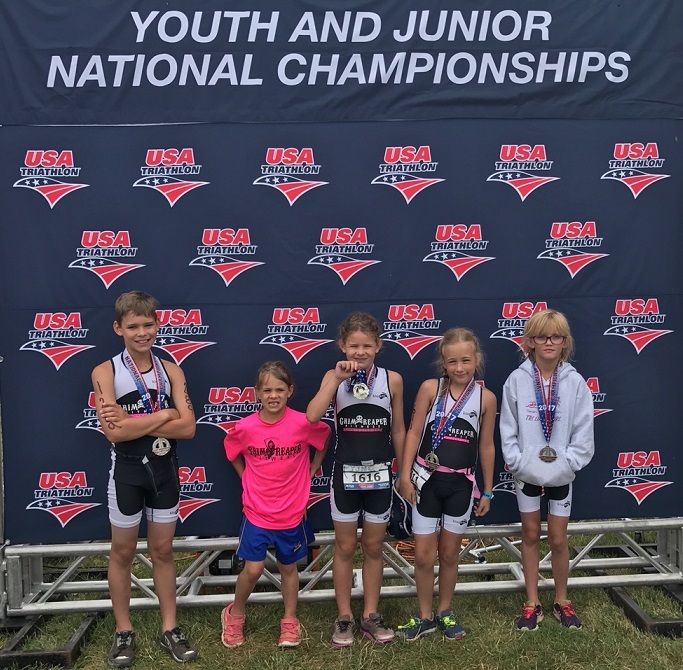 WESTCHESTER, OH – Grim Reaper Fitness made it’s second trip to USA Triathlon (USAT) Youth & Junior Nationals a learning experience here Sunday. Six athletes completed at the Age Group level and had to overcome first-time jitters, a bike crash, and some directional confusion to complete the race, but all the athletes had fun and were able to complete the race. All athletes aged 11 to 15 swam 200 meters, biked 10 kilometers, and ran two kilometers, while the 7- to 10-year-olds swam 100 meters, bike five kilometer, and ran one kilometer. Isaac Goughnour had the group’s best time, finishing in 34:49 to finish 20th among 14-year-olds. Ainsley Matthews overcame a wrong turn on the bike course to finish 41st among 13-year-old-girls, while Alex Thurston crashed on the bike, but still finished 22nd in the 11-year-old age group. Bella Thurston had the best time in the younger group, finishing in 24:55 for 23rd place among 9-year-olds, while Sophia and Addison Donahue, were 28th among 9-year-olds and 8th in the 7-year-old division, respectively.